Maine Yacht Center’s floating concrete breakwater protects against northeast storms that destroyed a previous structure. The marina for Maine Yacht Center had been built in 2003. 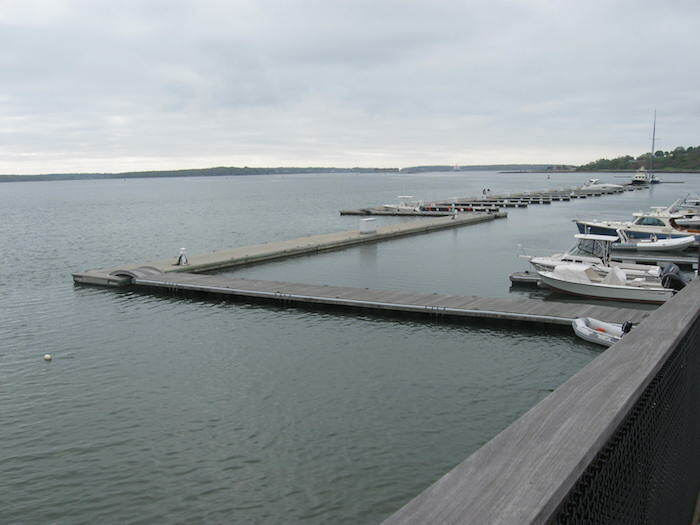 Because of the marina’s exposure to the northeast, they had installed a wooden wave-attenuating system. Brian was hired as general manager of the Maine Yacht Center in 2005. In May of that year, a nor’easter wiped out the floating breakwater and, if I remember correctly, a good portion of the marina as well. Rendering of a similar system, the larger SFMB 1000. 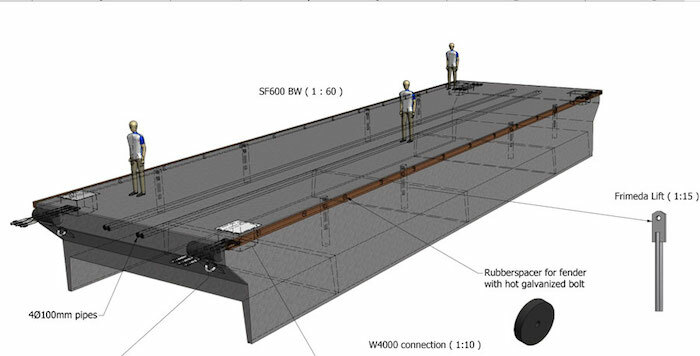 Brian and his team investigated several solutions to this problem, and settled on one of SF Marina’s concrete floating breakwater systems—in this instance, the company’s smallest model, the SFBW 300. It was installed in 2006. And what a system! Maine Yacht Center’s floating breakwater is 990′ (302m) LOA x 14′ (4.3) beam x 4′ (1.2m) draft x 650 tons displacement. It’s anchored by heavy chains and 600-lb (272-kg) ship anchors. So far, says Brian, 30 knots of wind over a 24-hour period are no problem. When I called him recently to see how it was holding up, he said in retrospect he wishes they’d purchased one of SF Marina’s larger systems.